Employees often disagree with workplace policies and practices, leaving few workplaces unaffected by organizational dissent. While disagreement persists in most contemporary organizations, how employees express dissent at work and how their respective organizations respond to it vary widely. Through the use of case studies, first-person accounts, current examples, conceptual models, and scholarly findings this work offers a comprehensive treatment of organizational dissent. Readers will find a sensible balance between theoretical considerations and practical applications. The book's specific focus and engaged voice provide students, scholars, and practitioners with a deeper understanding of dissent as an important aspect of workplace communication. Jeffrey Kassing is Associate Professor of Communication at Arizona State University. Chapter 1: Why is Organizational Dissent Relevant? Chapter 2: What is Organizational Dissent? Chapter 3: How Do We Make Sense of Organizational Dissent? Chapter 5: How Do Employees Express Dissent? Chapter 6: Upward Dissent Anyone? Chapter 7: Can Organizational Dissent Be Managed Well? "This scholarly acknowledgement of the vital role of dissent is refreshing and long overdue." "Kassing convinces the reader that the question of organizational dissent is of singular importance in the study of organizational communication. The book provides an interesting synthesis of the attitude research designed to tease out the intricacies of dissent, and it is replete with the stories of some of our most important dissenters." "Dissent in Organizations is an important book for students, scholars, and indeed citizens in general. 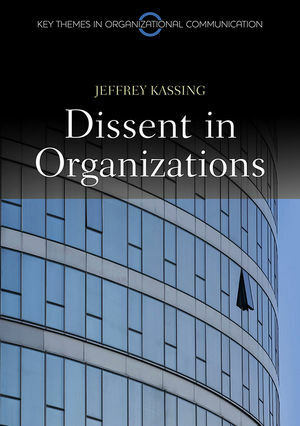 Kassing widens and deepens our understanding of why and how dissent occurs in organizations. Above all, this book helps to build an important bridge between our understanding of what we do during a huge proportion of the hours of our lives - that is, work - and our common commitment to democratic practices." "Dissent in Organizations is a ‘must read' if you have ever made suggestions for change and been surprised at others' reactions. The book provides an insightful and interesting integration of research on dissent across multiple disciplines. It is full of excellent examples that have immediate relevance to managers and employees across all types of organizations."